good home there. In 1912, together with his sons, he again engaged in farming and cattleraising, still maintaining his house in town. A view of his large farm residence, with its barns and sheds, together with a sketch of the town house, is to be found on another page of our work. Mr. Dodge has enjoyed genuine pioneer life in a "soddy," living for two years in a house of that construction on the ranch in Loup county. Deer were plentiful in those times. Mr. Dodge killed one while living there, and his brother one winter killed seven in one week. Mr. Dodge suffered the loss of his entire crop during the drouth of 1894, and lost all of his hay and about half of his corn in the severe hailstorm of 1893. On December 23, 1886, Mr. Dodge was married to Mrs. Alice Adamson, of Iowa, and Mr. and Mrs. Dodge have had five children born to them: Perry A., died in 1907; Jackson O.; William E.; Angie A., died in 1898, and Lotta A., all the surviving children residing at home. Mr. Dodge is a successful man of affairs, owning three hundred and eighty-two acres of stock and farm land, as well as good town property. He has passed through much of Valley county history, and during his residence here, has become one of the most popular and substantial citizens of his community. He has served as treasurer of school districts numbers two and sixty-three for several years. 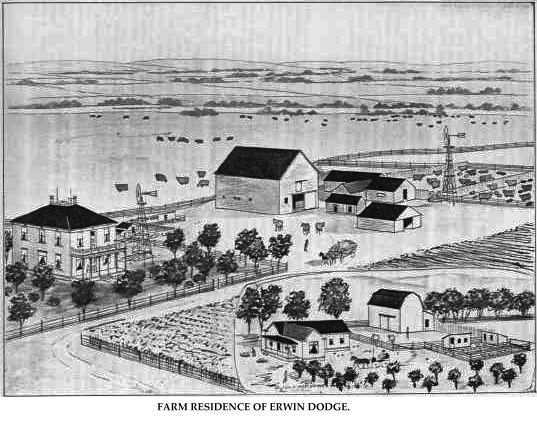 Farm Residence of Erwin Dodge. Leonard Schmitz, during his lifetime a prominent land-owner of Pierce county, Nebraska, was a native of Prussia, and was born December 15, 1847, a son of Nicholas Schmitz, who came to America in 1860. He first settled in Dubuque county, Iowa, where he was a prosperous farmer. Here Leonard grew to manhood, and was married at Sherrill's Mound, that county, January 19, 1875, to Miss Louisa Link. Mrs. Schmitz was a native of the village of Balltown, Dubuque county, Iowa, born June 16, 1855, a daughter of Andrew and Regina (Laite) Link, natives of Wittenberg and Baden, Germany, respectively. After marriage, Mr. and Mrs. Schmitz lived in Dubuque county about eighteen months, moving to Sac county, Iowa, in October, 1876. Here Mr. Schmitz opened a furniture store at the new town of Odebolt, and continued in business there nine or ten years. About 1886 he came to Nebraska and a year later purchased a farm on the north line of Pierce county, six miles from Osmond, Nebraska, but did not move onto it until the year following. During the two years prior to his taking possession of his land, he lived with his family in Creighton, Norfolk and Newman's Grove, and was at the latter place during the well-known blizzard of January 12, 1888, when a child and man in the vicinity lost their lives in the storm. Later he added to his possessions, until, at the time of his death, he owned five or six good farms in the visinity [sic] of Osmond, which are cultivated by tenants. In 1904, he bought a quarter section at the northwest corner of Osmond, and built a large two-story residence, with modern improvements, and moved into the new dwelling in February following. It was not ordained he should long occupy the new home, his death occurring on May 20, 1905. In politics Mr. Schmitz was a democrat, and, with his family, a member of the Catholic church. Mr. Schmitz, as a young man, served three years in the Sixth Iowa Infantry during the war, seeing service on the frontier along the Missouri river, his command going as far north and west as Fort Pierce and Fort Sully. The exposure during this campaign injured his health to an extent that he was never quite well again. To Mr. and Mrs. Schmitz twelve children were born, whose names are as follows: Dionoicious, deceased, was at the time of his death cashier of a bank in Bristow, and so highly were his services appreciated that he was given a bonus above his salary; Mary, married Lawrence Brown, an extensive land-owner in Gregory and Tripp counties; Frank; Leonard, junior, who occupies the home farm; Julia, a graduate of the Wayne Normal School; Edward, Fred and Ben, deceased; Frederick, graduate of a commercial college at Omaha; Benedict, who, with George, attended St. Francis' Seminary at Milwaukee; and Clara C., the youngest of the family. When Mr. Schmitz settled with his family in Pierce county, the country was open for miles in every direction. Indians occasionally roamed through the country, and, while living in Creighton, their house was over-run one night by refugees from a supposed Indian massacre - a hoax, as it afterward proved to be, caused by some young men returning from a charivari full of hilarity and "good cheer." Three seasons, known as the "dry years," proved disastrous to the crops, and caused the north fork of the Elkhorn river to run dry. Fish in the pools along the creek were plentiful during those years. Mr. Schmitz was of the thrifty type of citizen that is the bulwark of our institutions. The country could in spare him in his prime. The history of the settling of America has been one of startling successes from the landing of Columbus up until the present day, and untold prosperity has been the lot of thousands of ambitious men. The great western states have furnished some splendid examples of this wonderful success, and among this number is the man whose name heads this review. Iver C. Nielsen was born in Howard county, Nebraska, July 28, 1874, and was the fifth child in a family of seven, born to Niels and Mary Ann Enevoldsen, who were among the early settlers of Nebraska, the father dying on the homestead in Howard county in the fall of 1907, while the mother and four children still survive. Iver grew up in his home vicinity, following farming as a boy, living with his parents up to his eighteenth year. He purchased land and begun farming on his own account when he was twenty-two years of age, locating on section eighteen, township thirteen, range eleven, where he owned eighty acres, which he operated until 1904, when he sold, and bought his present place in section fifteen, township thirteen, range eleven, where he now owns one hundred and forty-eight acres of finely-improved land, on which he has built a handsome residence, and all good, substantial barns, sheds and other farm buildings necessary for stock. His farm is situated on the table land, just adjacent to the Loup river bottom land, lying about two miles southwest of the town of Dannebrog. This was originally the old Schlytern farm and homestead, and our subject now has one of the best equipped and most productive places in his vicinity. Mr. Nielsen was married on June 1, 1898, in Howard county, to Jennie S. Nelson, who was born in Sweden, but came to America with her parents when a very small child, the family being one of Howard county's pioneer settlers. Before her marriage, Mrs. Nielsen was a teacher in the public schools of Howard county, and was well known and a popular member of the younger social set of the locality. Mr. and Mrs. Nielsen have one daughter, Esther. Rufus J. Collins, son of John C. and Fanny (Godfrey) Collins, was born in Allegheny county, New York, November 2, 1842, and was fifth in a family of six children. He now has two brothers residing in New York state, one brother and one sister in Nebraska, and one brother is deceased, his death occurring October 8, 1889. The parents came to Nebraska, where they passed their declining years, the mother dying November 8, 1874, and the father September 2, 1886. Mr. Collins received his education in the schools of his home state, and on August 15, 1862, enlisted in Company H, One Hundred and Thirtieth New York Infantry. One year later he was transferred to the First New York Dragoons Cavalry, serving until close of war. He received his discharge, June 30, 1865, at Clouds Mill, Virginia. Decisive engagements participated in were Sheridan's Raid, May 12, 1864; Cold Harbor, Virginia, May 31 and June 1, 1864; Winchester, September 19, 1864; Cedar Creek, October 17 to 19, 1864; Trevilian Station, June 11 and 12, 1864, in which engagement Mr. Collins was wounded in the cheek by a piece of shell; Old Church, May 30, 1864; Hawes Shop, May 28, 1864; in the memorable battle at Appomattox Court House, when General Lee surrendered, April 9, 1865, and many other engagements, participating in all in sixty-five engagements, but, through illness at the time, missed participating in the grand review. After the war, Mr. Collins returned to New York, and the following December went to Wisconsin, engaging in farming first in Marquette and later in Waushara county. On June 2, 1867, Mr. Collins was married to Miss Elizabeth L. Root, a native of New York. Miss Root had been a teacher in Wisconsin schools for a number of years. In June, 1872, Mr. Collins came to Valley county, Nebraska, filing on a homestead of one hundred and sixty acres in the northwest quarter of section fourteen, township nineteen, range fourteen. He then returned to Wisconsin for his family, coming overland with ox team, camping by the wayside for seven weeks, and, with his wife and one son, moved on to the homestead in June of 1873. Mrs. Collins died, April 17, 1906, in Ord, survived by her husband and one son, Emmett. Mr. Collins is one of the earliest settlers of the county, and is widely and favorably known as a prosperous man of affairs. He owns good city property aside from his farm, and also has land interests in Kansas. He is a man interested in all pertaining to the welfare of his home state and county. In 1910, the son, Emmett, built a modern, eight-room residence on the old homestead, which is wired for electric lights, and heated by the hot-water system. Mr. Collins is independent of party lines in politics, is a member of the Odd Fellows, and a comrade of the Grand Army. Mr. Collins' first residence in Nebraska was a log dugout with a sod roof, in which he lived five years. The lumber for his first frame dwelling was hauled from Grand Island, a distance of sixty-five miles. He experienced all the hard times of the early settlement of Nebraska, losing all his crops in 1874 by the grasshopper swarms, and by drouth in 1894. Two years hail destroyed every growing thing on his place. During the three-day blizzard of April, 1873, Mr. Collins had occasion to brave the storm each day. Deer and elk were plentiful in the early days, and Mr. Collins secured two elk and his father five, four of them with two shots. Such were the days of the early settlement in strong contrast with the present time. Prominent among the old settlers and agriculturists of Madison county, Nebraska, stands the name of Samuel P. Tyrrel. He is accorded a high place because of his sterling qualities and upright dealings with his fellow men. He has done much toward the bettering of conditions in his home state and county and is highly respected in his community. No one is more public-spirited than he, and his progressive attitude relative to matters of local nature bring him to the front in the affairs of the locality where he resides. Mr. Tyrrel resides in section twenty, township twenty-two, range one, where he has a pleasant home and valuable estate. Mr. Tyrrel is a native of Massachusetts, being born in that state in July, 1844, and his parents, Franklin and Anna Maria (Parks) Tyrrel, are also natives of New England. Our subject was reared and educated in his native state, and upon attaining his majority, he left the state of his nativity, settling in Wisconsin in 1865, and remaining there until 1871, when he drove to Madison county, Nebraska, and after his arrival here, took up a homestead claim, and on this built a sod house, living in this house, "batching it," for one year. In the early days, Mr. Tyrrel experienced many hardships and discouragements. The grasshoppers took all the crops the first three years. Many times he had to fight prairie fires to save his home and possessions, and in 1894 he lost all his crops by the hot winds that prevailed during the drouth of that year. Columbus and Wisner were the market places, and deer and antelope were plentiful in those days. Mr. Tyrrel was united in marriage in 1873 to Miss Lou R. Stevenson, a native of Kentucky, and a daughter of Robert and Mary (Howe) Stevenson. Mr. and Mrs. Tyrrel are the parents of four children, whose names are as follows: Minnie, Percy, Walter and Claud. They are highly respected in their community, and enjoy the good will of a large circle of friends and acquaintances. Benjamin L. Nicholas is one of the original homesteaders of Custer county, Nebraska, still residing on his original farm. He passed through the experiences of those who were living in the county during the years of drouth and bard times, and by close economy and native thrift, managed to make a good start as a farmer and ranchman, being now one of the most prosperous men of the region. He was born on an estate known as Holloway, near Narbeth, Pembrokeshire, Wales, March 10, 1856, being eleventh in the order of birth of the eighteen children of Thomas and Martha (Lewis) Nicholas, who had nine sons and nine daughters. His parents are deceased, but he has two brothers and four sisters living in Wales. Mr. Nicholas grew to manhood on a farm in his native country, and there married, February 28, 1881, Miss Margaret Beynon, a native of Merthyr, Tydville, in Glamorganshire where Mr. Nicholas served on the police force for six years. Her parents were John and Ann (Williams) Beynon, who died in their native country. In April of the same year, the young couple came to America, sailing from Liverpool for New York in the "Boothnia," landing after a voyage of nine days. They are the only members of the Nicholas or Beynon families to leave Wales for the United States. Mrs. Nicholas has two brothers living, one in England, the Rev. D. J. Beynon, of the Congregational church, and one in Wales, but her parents are deceased. Mr. Nicholas and wife first settled in Pottawattamie county, Kansas, remaining on an eighty acre farm on Buckshot creek until April, 1884, when they came to Custer county with their two children, taking a pre-emption claim on the southeast quarter of section eight, township thirteen, range eighteen, where they have made their home since. They now own a well-improved and equipped grain and stock farm of eight hundred acres, having a comfortable home and pleasant surroundings. Mr. Nicholas has been very successful in raising cattle and hogs, as well as small grain. He is established in the confidence and esteem of his fellow citizens, and he and his wife have always taken an active interest in church and school. They assisted in the organization of the first church and Sunday school in their vicinity, and Mr. Nicholas has served some time on the school board, being at the present time treasurer of district number two hundred and forty-four. In 1891 to 1894 he served as a member of the county board of supervisors, and has served one term since then. He and his family are among the best known pioneers of the county, and are highly respected by all. Nine children have been born to Mr. Nicholas and wife: Martha Anne, born in Kansas, is the wife of Edwin Burrows, an enterprising merchant of Mason City, and they have three children; Mary Theodosia, also born in Kansas, is the wife of Nels Peterson, of Mason City, and has two children; Margaret Brittania, born in Custer county, is the wife of Carlton Bunnell, living near Detroit. Minnesota, and has one child; Sarah Jane, a teacher of music, is taking the musical course at the Grand Island Baptist College; Alice Ursula, taught two years, and is now attending the State Normal at Kearney; Gwendolyn Irene, Elizabeth Marian, John T. and William L. were all born on the home farm. Four of the daughters have taught school, and most of them are graduates of the Mason City High School. Their first home was a "soddy," only twelve by fourteen feet, with a leather latch to the door. For nineteen years the family lived in a "soddy," and in 1903 built a comfortable frame cottage. Kearney was their market place in the early days, and when they first traveled that trail, there was no bridge on the South Loup. It required four days to make the trip of forty-five miles. January 12, 1888, Mr. Nicholas and his eldest daughter were out in the blizzard for a time. A lantern had to be used to get to the stables to feed the stock. Practically nothing was raised in 1894, the dry year, and was for all the settlers a period of great suffering. Mr. Nicholas has attained two degrees in Masonry, and is a member of the Modern Woodmen of America. In politics he is independent. Among the public-spirited German-American citizens of Wayne county, Nebraska, none have been more intimately associated with the best interests of their community than Lewis Beckman, who is one of the most successful farmers and stockmen of the county. He was born in Colberg-Munde, Germany, November 14, 1847, and is a son of Frederick and Carolina Beckman, who spent their entire lives in that country. He received a public school education in his native place, and at the age of fourteen years, left home, and spent seven years sailing before the mast. He visited many countries, and had many interesting experiences, and in this way gained self confidence and independence. About 1869, he came to the United States, landing first in Pensacola, Florida, the vessel on which he sailed being wrecked there. He spent a few months in Pensacola, and then sailed for Boston, his life as a sailor ending there. Later he was in Rhode Island, Chicago, Kansas, and from the latter place back to Mt. Morris, Illinois, where he was married. He then went to Iowa, where he rented in Iama county for five years. He then moved to Franklin county, and there bought and operated an eighty-acre farm for eight years. Mr. Beckman came to Wayne county in 1888. He rented for three years, and then purchased a farm of one hundred and sixty acres on section nine, township twenty-seven, range three, where he erected a shanty, fourteen by twenty feet in dimensions. He immediately set out to improve and develop his farm, and now has a beautiful home, with all possible comforts and conveniences, and uses improved machinery and modern conviences in carrying on his work. He now owns three hundred and twenty acres in Wayne county, and has given his children considerable land he had acquired in South Dakota. Mr. Beckman was married, February 27, 1876, to Miss Augusta Shieder, who was born in Germany in 1851, a daughter of Frederick and Carolina Shieder. She came to the United States with her mother, sister and brother in 1867. Prior to this, two brothers had come to the United States, and earned money to send for them. Twelve children were born to Mr. Beckman and wife, of whom the following nine are now living: Charles, William, Carrie, Mary, George and an infant son are deceased. Both Mr. Beckman and his wife have many friends throughout Wayne county, where they are well known and highly regarded. He has always given his support to measures for the, public good, and has been actively interested in securing educational advantages for the children of the community. James W. Yockey is one of the most prominent citizens of Comstock, Nebraska, the owner of a well-equipped stock and grain farm, and having various business interests in Custer county, where he was an early settler. He is well known as one of the organizers of the Partners and Merchants Bank of Comstock, of which he is vice president and director. This bank was organized for home interests, in October, 1909, and has steadily progressed in prosperity and growth. Mr. Yockey was born in Franklin county, Pennsylvania, September 17, 1859, eldest child of Oliver and Anna (Dougherty) Yockey, who had three sons and four daughters. The parents were natives of Pennsylvania, where they were married. The father served in the Civil war; at its close returned to his home in Pennsylvania, and shortly afterward moved to Lincoln, Illinois, living there until he came with his family to Johnson county, Nebraska, in 1881. Those who came to Nebraska with their parents were their son, Charles F., and three daughters, Hattie, Clara and Grace. He had carried on farming in Illinois, and in the spring of 1881 rented a farm in Johnson county, later buying land there. The parents now live in Adams, Gage county, Nebraska. Their son, Charles F., lives at Fort Morgan, Colorado; Clara, Mrs. Gus Nealy, resides in Sterling, Nebraska; Grace, Mrs. Chandler, lives in Lincoln; Katie, Mrs. Frank Fritz, lives near Topeka, Kansas; Hattie, Mrs. James Burnham, lives in St. Joe, Missouri, and James W., the eldest son, is the subject of this sketch. name of Barnhouse & Yockey. After spending a year in business, he traded his interest for a farm of three hundred and twenty acres in Custer county, although he did not locate on it. He then engaged in farming and stock raising in Gage county for a time, then again became a merchant in Adams, but soon afterward resumed farming. He made a specialty of buying, feeding and shipping stock until December, 1902, when he located near Comstock for a permanent residence. He there engaged in the implement business, but retained possession of a farm, where he had large stock interests. He owns about eight hundred acres of choice land near Comstock, and has a well-equipped livery and feed barn. He has a home, and is actively engaged in managing and looking after his varied interests in the vicinity. He is well known for his public spirit, and for his strict integrity in all business dealings. He is a keen business man, and has made a success of his different lines of investment. Five children were born to Mr. Yockey and wife, of whom four now survive: Bertha, Mrs. George N. Bryson, living on a farm near Comstock, has two children; Charlie, in business with his father; Dottie, deceased; Harvey, connected with his father in business; Levi, at home. The three last-named were born in Nebraska. John Dwinell, an agriculturist and stockman of prominence in Knox county, Nebraska, resides in Jefferson township, and is one of those substantial citizens whose sterling qualities have added so materially to the wealth and growth of Nebraska. Mr. Dwinell is a native of Wisconsin, his birth occurring in 1859, and he is a son of James Madison and Almira (Simons) Dwinell, who were natives of Vermont and New Jersey, respectively. From Wisconsin, Mr. Dwinell, with his parents, went to Carroll county, Illinois, and in 1872 came to Cass county, Nebraska, where they bought land for six dollars per acre. Here the family endured many hardships and dangers. They suffered the loss of their crops for three successive years through the grasshopper pests which infested this region in the early years, and in various other ways experienced losses and failures of crops. Mr. Dwinell was united in marriage in 1878 to Miss Ellen Irons. Mr. and Mrs. Dwinell are the parents of five children, whose names are as follows: Maud, who is the wife of F. Garnsey; Alma, wife of Gregg Caulfield; Addie, now Mrs. Ross Doll; Bertha, and Pearl. In 1881, Mr. Dwinell, with his family, came to Knox county, Nebraska, driving the entire distance, from Cass county, and took up a homestead, on which they built a house, twelve by eighteen feet. Here the family suffered losses through the hailstorm of 1901, and in various other ways, but Mr. Dwinell has succeeded in developing a good farm, on which he is engaged in mixed farming and stock raising. He now owns eleven hundred and twenty acres of fine land, and his place is well improved with good buildings and a fine residence. He also has a fine grove and orchard. Jeremiah Reed, owner of a finely-equipped farm in Ashland precinct, is one of the esteemed and respected citizens of Boone county. He has always been an energetic and progressive agriculturist, and well merits his present comfortable surroundings and many friends. Mr. Reed was born in Washington county, Illinois, on March 4, 1857, the youngest of five children in his father's family. Both parents are now deceased, the mother dying when our subject was but six years of age. The only members of the family now living are himself and one brother, H. W. Reed, who resides in Albion, and a half sister, Mrs. James F. Browder. After reaching manhood, Mr. Reed left Illinois, and settled in Iowa, and in the fall of 1878, in company with friends, Bert Nurton, Joe Allen and Sidney Wilton, came overland to Boone county, Nebraska. They traveled with a single team, and purchased a farm here, built a shanty, and, after a short stay, returned to Iowa, where, on January 1 of the following year, Mr. Reed was married to Miss Alice Conat, at the home of her grandfather in Delaware county. After a month's visit there, the young couple started back to their new home, and started in to develop a good farm, remaining on their original place up to 1880, when Mr. Reed homesteaded on northeast quarter of section twenty-eight, township twenty-one, range seven, and this has been their home since that time, with the exception of about six years, which were spent in Colorado. Mr. Reed has been very successful in his chosen work, and is called one of the well-to-do men of his vicinity, having a finely-equipped farm, and raising considerable stock and grain each year. Mr. and Mrs. Reed are the parents of the following children: Pearl, Frank and Flossie, all married and living in different parts of Colorado, and Florence and Vernon C., at home. While our subject has never been active in politics, he has ever taken a deep interest in the general affairs of his county and state, and has earnestly striven at all times, in his quiet way, to aid in promoting the general welfare. stockmen, and, after many years of hard labor, is now prepared to enjoy the remaining years of his life. Mr. Stewart was born in Scotland, August 16, 1844, at Kirriemuir, Forfarshire province, where he grew to manhood on his father's farm. His father, Robert Stewart, died fourteen years ago, at the age of seventy years. When our subject came to this country, he went to Glasgow, and sailed direct to New York. He at once started for the west, and settled in McHenry county, Illinois, where he remained thirteen years, renting a farm. After Mr. Stewart was nicely located in America, he sent for his sweetheart to come here, and in 1872 he was married to Miss Mary Sterling. To Mr. and Mrs. Stewart eight children have been born, as follows: John, who is married to Ida A. Ragland, and has seven children; Mary, wife of Mr. Chalfoint, and has two children; Nellie, wife of George Fosburg, has one child; James, who is married to Nettie Couch, now lives in Holt county, Nebraska, and has one child; Flossie, Peter, George and Katie and Gene, deceased. In 1884, Mr. Stewart came to Antelope county, Nebraska, and there took up a homestead in section thirty-four, township twenty-seven, range seven, on which he built a good frame house. During the drouth in every section of this country, our subject had good crops, and sold them at high prices. Although fortunate in that respect, our subject had other hardships in the early days, among other experiences fighting prairie fires to save his home and property, and in 1895 a terrific hailstorm caused a heavy loss. Mr. Stewart now owns four hundred and eighty acres of good Nebraska land, and is a prosperous and progressive farmer and stockman. John A. Fiscus, Jr., one of the younger self-made men of central Nebraska, began life for himself at an early age, and has been successful as a farmer and stockman. He is known as a man of strict integrity and public spirit, and is held in high esteem by all who know him. Mr. Fiscus was born near Aledo, Mercer county, Illinois, July 17, 1870, fifth child of John and Eliza (Latham) Fiscus, who had four sons and four daughters. Both parents were natives of Indiana, where they were reared. He was born and reared on a farm, receiving the usual district school advantages given a farmer's son. The mother died in Mercer county, June 30, 1880, and in September, 1884, the father, having remarried, brought his family to Furnas county, Nebraska, making the trip with a team and wagon camping along the wayside in a tent for seven weeks. The eldest son had preceded him to Nebraska, and was living in Clay county. From this time, the son, John, began to look out for himself, and, being a boy of ambition and self-reliance, was able to provide for himself with but little assistance. The father was born March 15, 1833. He lived at Ansley until February, 1911, when he returned to Freedom, Indiana, to spend his remaining days. The mother was born February 10, 1833. They were married in Boone county, Iowa, October 18, 1855, and moved to Illinois in 1869. Six of the children of this family now survive, namely: Mrs. Lottie Bivens, of Mercer county, Illinois; Mary, wife of George Brown, lives in Oklahoma; Jane married William McCulley, and lives in Mercer county, Illinois; John A., of this sketch; Della married Nearest Sperry, and lives in Missouri; Elisha J. is married, and lives in Yarmouth, Iowa. John A. Fiscus first came to Custer county in 1888. He was married at Grand Island, Nebraska, September 6, 1895, to Lizzie Ochsner, daughter of Chris and Catherine (Engelhardt) Ochsner, old settlers in Nebraska. They are Germans, who moved from Bavaria to the village of Worms, in Russia, when Christian was twelve years of age. Here he married, and lived until July, 1874, when, with his family and his parents, he sailed from Hamburg to New York on the "Schiller," the voyage lasting over ten days. They came direct to Sutton, Nebraska, reaching their destination September 6, and have since resided there. Mr. Fiscus brought his family to Custer county in 1897, and they live on the Lee farm, on section thirty-one, township sixteen, range eighteen, a tract comprising two hundred and eighty acres of farm and grazing land. He and his wife have five children: Edna Olefa, Ella Elizabeth, Edgar A., May Irene and Della Loene. The first two were born in Clay county, and the last three in Custer county. Mr. and Mrs. Fiscus are well regarded in the community, and have, many friends. Mr. Fiscus is a populist in politics, and a member of the Modern Woodmen of America. tion in the local schools, and grew to manhood on the farm. On April 6, 1882, he was united in marriage to Miss Josephine M. Adams, who was born in Hamilton county, Indiana. Her father, Samuel D. Adams, of Scotch-Irish parentage, is a descendant from the same ancestors as John Quincy Adams. He lives in Carmel, Indiana. Her mother, Nancy (McDuffy) Adams, of Irish descent, died in 1866 in Indiana. Mr. and Mrs. Klingler have had no children, but have one adopted son, Clifford H. He is married, has one son, and lives in North Loup, Nebraska. In September, 1884, Mr. Klingler came to Thayer county, Nebraska, remaining one and a half years; then went to Sherman county, Kansas, where he homesteaded one hundred and sixty acres of land, but early in 1887 returned to Nebraska, going to Furnas county. Owing to failure of crops while living here, Mr. Klingler worked for the Burlington and Missouri railroad company for about three years. In November of 1890, Mr. Klingler came to Valley county, having only his team, together with a cow and a calf, and a debt for money borrowed to make his way here. By 1903 he was able to purchase eighty acres of land in section twelve, township seventeen, range thirteen, which is still the home place, a well-improved grain farm. We are pleased to call attention to the home and surrounding buildings on one of our illustrated pages. Mr. Klingler has served on his school board for a number of years. He is one of the younger men among the pioneers of his locality, and is widely and favorably known. Mr. and Mrs. Klingler are both prominent in lodge circles. Mr. Klingler has for seventeen years held membership in the Ancient Order of United Workmen, and is also an Odd Fellow and Rebekah. Mrs. Klingler is a member of the Degree of Honor, and at different times has held all the offices of the organization. She is at present writing noble grand of the Rebekahs. She was reared in the Christian church, while Mr. Klingler grew up in the Methodist faith. He is republican in politics. Mr. Klingler has given much attention to popcorn as a crop, the Loup valley being well adapted to raising this product. He thoroughly understands its culture, and has made it one of his most profitable crops. 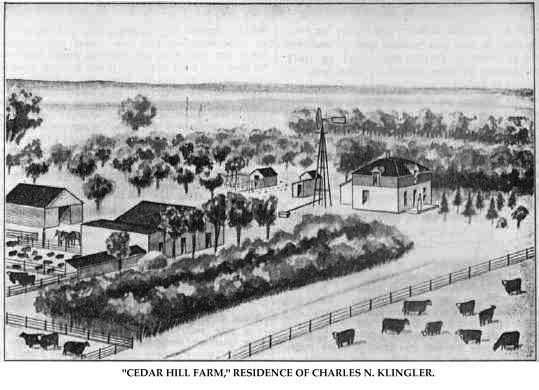 "Cedar Hill Farm," Residence of Charles N. Klingler. Nebraska has much to be grateful for in the achievements of its hardy pioneer settlers, who dared to penetrate into what were then dry and desert regions to make good homes and fertile farms. Such a one is our subject, Charles Dedlow, who resides on the northwest quarter of section one, township twenty-seven, range four, Pierce county, Nebraska. He is one of the prosperous farmers of that region, where he has lived for the past forty years. Charles Dedlow was born, November 8, 1850, in the province of Mechlenburg-Sterlitz, Germany, and is the son of Frederick and Fredrika (Green) Dedlow, who made Nebraska their home during their later years. The father died in 1901 at the age of seventy-eight years, and the mother in 1906 at the age of eighty-five years. Our subject received part of his schooling in Germany, and then came with his parents to America, embarking at Hamburg the latter part of October on a sailing vessel. They were nine weeks and three days making the voyage to New York City. After coming to the United States, the Dedlow family settled in Jefferson county, Wisconsin, early in January, 1867, where they rented a farm, and, lived four years. In June, 1871, the parents moved to Pierce county, Nebraska, settling on the northeast quarter of section ten, township twentyseven, range four - the first settlers on Dry creek which has remained the home place. They drove from Wisconsin to Pierce county, being from April to June on the way. They first built a log house, hauling the logs from Knox county, and lived in this house four years, then building a frame house. Charles Dedlow came to Nebraska in March, 1872, and took up a tree claim on the northwest quarter of section one, township twenty-seven, range four, on which he now lives. A fine view of his place appears elsewhere in this work. There are over thirteen acres of fine trees on this land. Later he acquired the northeast quarter, having three hundred and twenty acres of unusually fine land. In migrating to Nebraska, Mr. Dedlow came as far as Wisner by rail, thence by stage to Norfolk, and walked from Norfolk to the claim. In the early days, our subject and family experienced many hardships and privations, for four years having nothing but hay for fuel, as was the lot of most of the early settlers. Among other experiences, hail in 1896 destroyed all his crops. Deer and antelope were plentiful, and their flesh was all the meat settlers had at times. Mr. Dedlow was married, October 27, 1878, to Miss Bridget Elizabeth Connervey, whose parents, James and Kate (Sherridan) Connervey, came from Ireland. The mother died, February 13, 1898, at the age of seventy-five years, and the father died, March 28, 1911, at the age of eighty-five years. To Mr. and Mrs. Dedlow fourteen children have been born: Mattie; Edward, who married Clara Stockman; Emma; Anastasia, who died in 1900; Gertrude, who died March 21, 1910; Minnie; Louis, who died June 24, 1894; Agnes, William, Viola, Charles, Lawrence, Clarence and Walter.